A body was found Thursday as search and rescue crews scoured an area of Zion National Park for a missing Northern Utah man. Crews in San Juan County are looking for a missing 3-year-old girl near Aneth, in the far southeastern corner of Utah. Macin Smith's mom, Tracey Bratt-Smith, doesn't hesitate when she's asked what she would say if she could sit on a new bench dedicated to her missing son and speak directly to him. A St. George man has been arrested after he allegedly burglarized a family's home-- while a mother and her young daughter were inside. A St. George man has been arrested on one count of first-degree felony disarming a police officer and four counts of third-degree felony aggravated assault after he allegedly shot at another car then tried to take an official's weapon. The St. George Police Department said Monday an endangered man who has been missing since July has been located. Officials euthanized a water buffalo that was "at large" south of Moab Saturday evening. St. George police said Monday a missing 66-year-old man who has dementia and schizophrenia has been located. The National Weather Service in Salt Lake City has issued a flash flood watch for large parts of Utah for Monday and Tuesday. A woman was killed Saturday afternoon when the vehicle in which she was a passenger rolled on Interstate 15 near Cedar City. The driver and six children were transported to area hospitals. A 2-year-old girl and a 22-year-old woman were critically injured Sunday morning after the vehicle they were in rolled on Interstate 15 in Millard County. A Nevada police officer is facing charges including three felony counts of sexual exploitation of a minor, involving a St. George teen. A Salt Lake Express bus traveling near Nephi on Thursday morning rear-ended a semi double tanker hauling gravel, causing injuries to several of the bus passengers. Officials in Iron County are asking residents to be on the lookout for a missing Iowa woman who has family in southern Utah. Officials in Panguitch are urging residents not to use drinking water, which has been found to be seriously contaminated. Iron County officials have revealed the names of the female suspect shot Thursday in Parowan, those of two male suspects charged in the case, and that of the officer who fired the bullets. A 71-year-old man died Wednesday at the boat ramp of Sand Hollow State Park. Officials have identified a 41-year-old man who died after he crashed his motorcycle on Center Street in Escalante Saturday. A small plane crashed Monday morning at the Kanab City Airport, and it came to a rest upside down. A rockfall in Zion National Park injured two visitors Sunday afternoon, officials said. 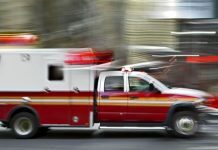 A St. George man suffered fatal injuries after he fell approximately 60 feet while rock climbing in Washington County Wednesday. A woman has been charged with child abuse-abandonment after her small children were found covered with bug bites and filth, and without food in a damaged trailer home in Washington County. A 13-year-old Utah County boy killed Thursday in an ATV accident in Southern Utah has been identified. A 13-year-old Utah County boy is dead after an ATV accident Thursday in Coral Pink Sand Dunes State Park. One woman is dead after a two-vehicle crash on State Route 59 in Southern Utah Thursday afternoon.